I am VERY EXCITED today to announce that the fabulous company, Shabby Apple, has given me a $50 gift card to give away to one of my wonderful guests!! As a bonus, all of my readers may receive a 10% discount at check out! Use the source code solesearchingmama10off. 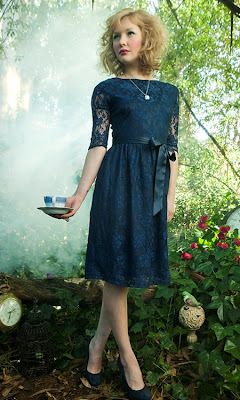 Shabby Apple is famous for their fabulously feminine, yet modest dresses. They also have sassy shoes, jewelry, handbags and more! There truly is something for everyone at Shabby Apple! 1. Enter the giveaway through as many links on the Rafflecopter below as you like. The more links you complete, the greater chance you have of winning! 2. PLEASE, if you are able to, leave a comment in the comment box letting us know what you think about Shabby Apple products, or even which one(s) you like best! 3. Tell your friends and family. If you are not interested in the gift card for yourself, remember that there's probably someone else whom you love who would be eternally grateful if you won it for them! GUYS be sure to sign up - you could surprise your lovely lady with an awesome gift if you win! Rock Around the Clock Sequined Skirt. This one just has party written all over it! Ballroom Blouse. I personally hope the lace trend never goes out of style. This blouse is stunning! The Red Queen Dress. Every woman looks beautiful in red! Jabberwocky Maxi Skirt. I see this skirt being the foundation to many outfits, dressed up or down, through all the seasons! I'm Late! I'm Late! Dress. Navy is a nice change from black, and this dress is simply lovely. Arripidae Dress. The color, the fit, the fabric, it's just downright fabulous!! Tea and Cakes heels. I know, you're thinking, "What would I wear those with??" Or maybe you're thinking, " I have to win the gift card, because those shoes are screaming my name!" Junya shoes. They also come in black. I love the curvy shape of the heel and the little tie on top. These shoes have so much personality! Okay, I must end there, or I'll be here all day!! Thank you for entering the giveaway!! Good Luck!! I own the Elizatbeth Islands dress and LOVE it!! Every time I put it on my husband laughs at me because I always say that I love this dress!! I have been a faithful Shabby Apple window shopper for years! One of these days, I'm actually going to own one of their pieces. :) Love the holiday choices. Oh, I hope you do get to own one some day! I check the sales, sometimes if you're patient you can score a deal. Maybe you'll be the winner of the gift card!! Love Shabby Apple style! Classy. Classic. Modest. Beautiful. I agree - you were the one who got me hooked! Must check that one out today!! Thanks for stopping by! the High Tea Skirt looks beautiful! Oh, I agree! And, skirts are so versatile, which makes them even more enticing! I heart Shabby Apple...have for years! Those Tea and Cakes heels are a MUST HAVE! Shoes are a weakness of mine, but I'm not sure that suede can survive the farm. They are lovely, though! Thank you for stopping by!! I will have to check out the FSA dress today! I really want that Cotton Candy dress!! Isn't is lovely?? Just add it to the wish list! Thank you for stopping by! Good luck! What a fantastic company. The Jackobethan looks like a great dress! Hey, and you're welcome for the Alabama loss (Aggie here). Go K-State! Yes, thank you for handing Alabama their first loss!! I used to love it when the Aggies would come to K-State for football games - their fans were awesome! I love the red dress. But I would love to have somewhere to wear the sequined skirt. Yep, the skirt is a bit crazy, but wouldn't it look awesome under a disco light?? Oh my goodness, these clothes are adorable!!!! This is great Susan! I like the Whistlestop dress. I love the co-ed skirt! What a great give away! I hopped over from the Aloha link...I enjoyed your site. Great idea! I love Shabby Apple. It's very classy and elegant! Every thing is SO cute! I love every one of the dresses! thanks for linking up again this week at the #MTMmixer...and thanks for a great giveaway! I really like the Mulholland dress. I love the Connoisseur dress! The Arripidae is my favorite, but I also like the Overboard! Thanks for the giveaway! Shabby Apple is really growing, aren't theY? I'm swinging by to say hi. I'm visiting from the Weekend Blog Walk. Those Tea and Cakes heels are gorgeous! I would wear them with some skinny jeans! The Tea and Cakes heels are absolutely to die for! I think that Shabby Apple is unique clothing. I don't own anything now but hope to soon! I like the blueberry pie apron. I just bought the "Scholar" skirt & can't wait for it to arrive.